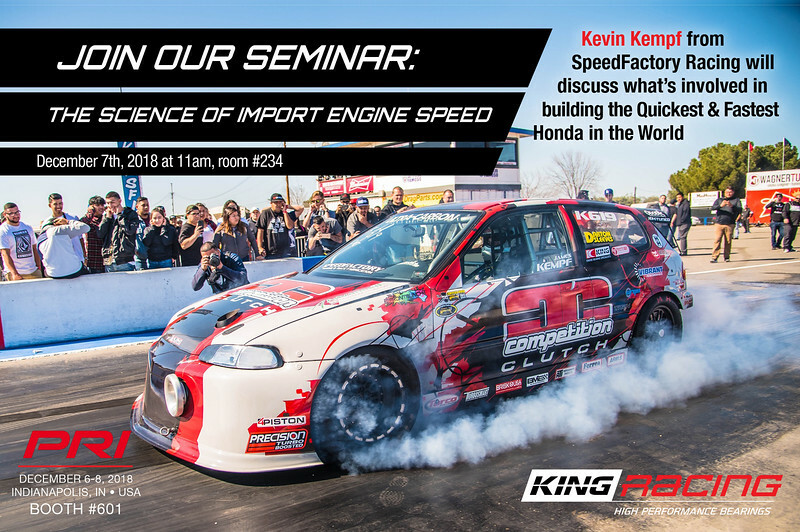 King Engine Bearings will sponsor and host a powerful technical seminar at the 2018 Performance Racing Industry (PRI) Trade Show, featuring four championship race engine builders. 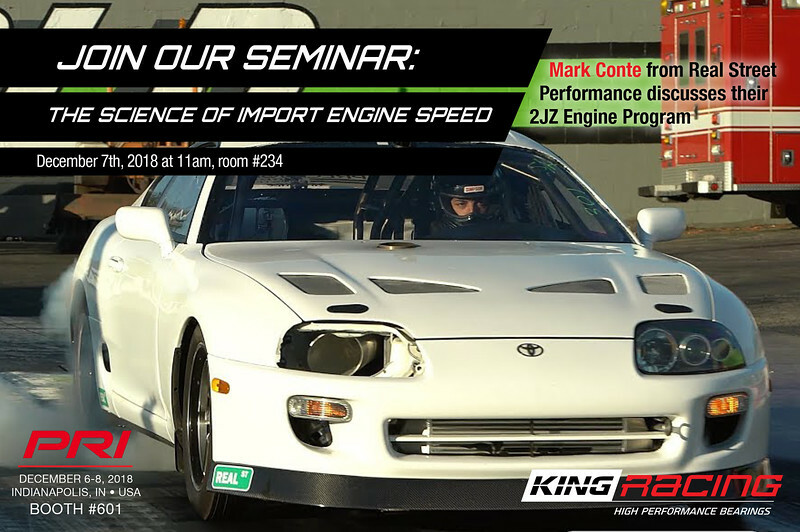 This will be of particular interest for any engine builder specializing in high output sport compact and import engines as King will be bringing together some of the best names in the industry. All have vast experience building record setting sport compact race engines and have seen it all when it comes to the challenges of building reliable and powerful race engines. 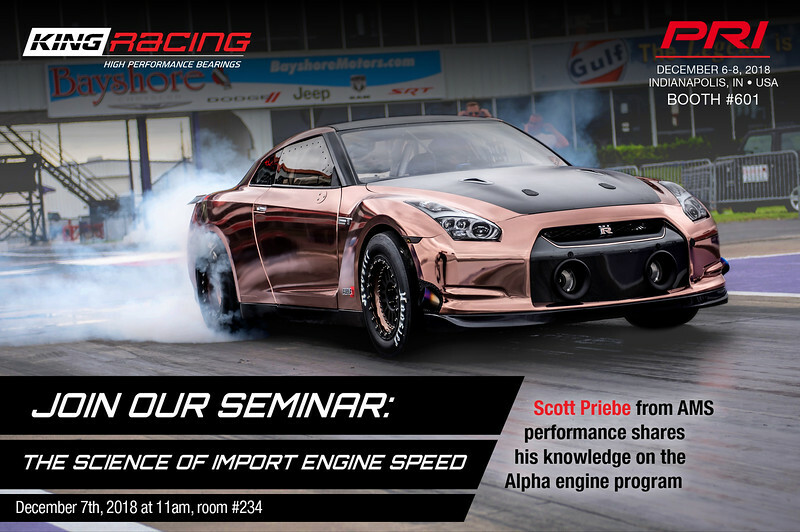 This one-of-a-kind seminar, focusing on sport compact engines, will address key issues such as clearance, oils, boost setup and more. If you will be attending the 2018 PRI show be sure to make time to benefit from this in-depth panel of championship race engine builders. You will have plenty of opportunity to ask questions! This free event takes place Friday, December 7 at 11:00am, Room 234 at the Indiana Convention Center in Indianapolis, IN. For priority seating at King’s technical seminar, RSVP at 800 772 3670 or e-mail inquiry@kingbearings.com. While at PRI don’t forget to visit the King Engine Bearings booth in the Green Hall at booth #601. 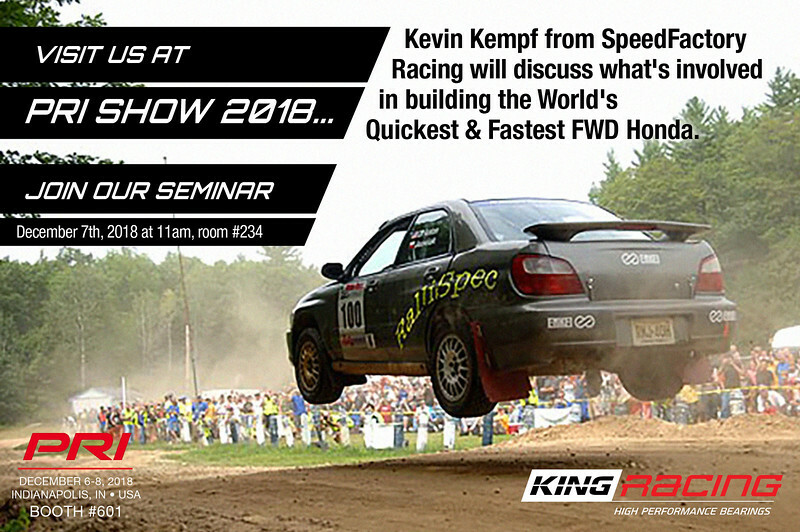 King will be displaying their new sport compact pMaxkote race bearings for the Nissan VR38 GTR, Subaru EJ/FA, Honda B&K Series, Toyota 2JZ and more. For domestic V8’s, King will display a wide range of pMaxkote race bearings including for Modular Ford/Coyote engines, GM LS small and big block engines and many more. And who can forget the swag!? King’s PRI booth will also feature a prize game and raffle where everyone is a winner! Take home some cool King gear including t-shirts, hats and other goodies. Founded in 1960, King Engine Bearings is a world-class developer and manufacturer of high technology engine bearings for automobiles, light and heavy-duty trucks, marine, aviation, standby power and other types of internal combustion engines. King’s only product is engine bearings. As a result of its specialization and focus, the company is recognized for producing the highest quality engine bearings available in the market today. The King line includes OEM replacement rod, main, cam bearings, and thrust washers and its special range of race bearings. King’s extensive bearing coverage for domestic and import applications ships from its main distribution center in Livingston, N.J. and 5 factory branch warehouses. For more information, visit www.kingracebearings.com. New Motor Mounts for Project DC2 Integra! Close to 7000km one way, I’ll have to pass even if it sounds interesting. Will you post a summary afterwards? The plan is to video the seminar to post afterwards. So stay tuned.